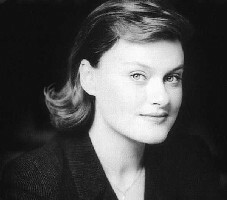 The mezzo soprano, Vesselina Kasarova, was born in Stara Zagora in 1964. As a child she began her musical studies as a pianist but changed to vocal studies at the Conservatory of Sofia as a student of Ressa Koleva. At the completion of her studies she debuted with the Sofia National Opera in 1988 as Fenena in Nabucco. With that company she specialized in the roles of Rosina, Dorabella, Fenena and Preziosilla in Forza del Destino. In 1989 she won the New Voices singing competition and between 1988 and 1991 was engaged by the Zurich Opera, singing the roles of Stephano in Romeo and Juliet, Anna in Les Troyens and Olga in Eugene Onegin with great success. At the Salzburg Festival in 1991-2 she sang the role of Annio in La Clemenza di Tito and in 1992 the title role in Tancredi at a concert performance. An engagement with the Vienna State Opera in 1991 led to her debut as Rosina in The Barber of Seville followed by performances as Pauline in Pique Dame, as Cherubino and as Preziosilla. She has appeared at the Grand Theatre Geneva as Rosina and 1992 in Barcelona as Pippo in La Gazza Ladra. In the United States, Vesselina Kasarova has appeared in Chicago and New York. She has done extensive concert work, specializing in Mozart in Zurich, Lausanne, and in Milan, where she sang in the Mozart Requiem. With a strong technique, the mezzo soprano specializes in the operas of the classical period composers Handel, Mozart and Rossini.